From New York to London to Milan and Paris, an abundance of rain was au rendez-vous during the FW18 fashion season. 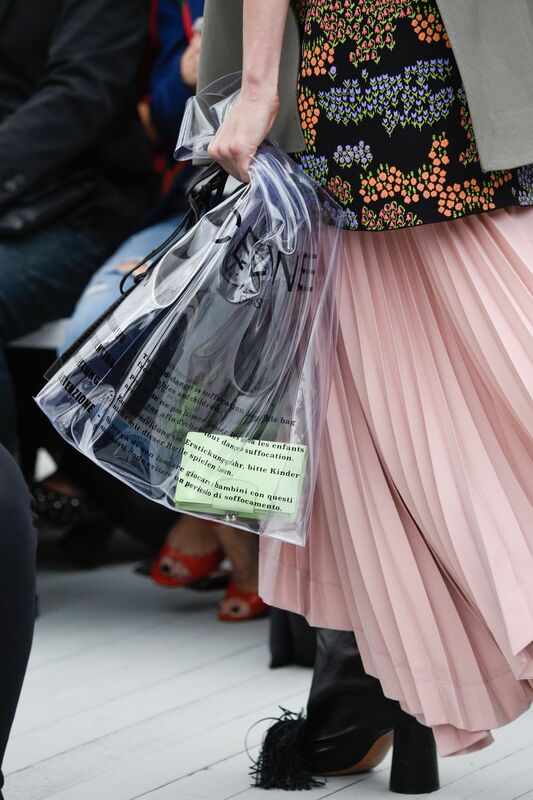 Forced to rethink their initial outfits and elevate their rainwear game, showgoers disinclined to let a little bit of unfortunate weather rain on their fashion week parade, gravitated towards water-repelling outerwear, footwear, and accessories cut from translucent PVC. Plastic is having a major moment! Cloudy with a chance of rainfall? No problem. Chanel’s got you covered (literally). Nobody put a fresher and more elegant spin on the rainwear trend quite like Karl Lagerfeld. For his Spring-Summer 2018 runway show, held at the Grand Palais, Mr. Lagerfeld propelled the idea of rain outerwear to the next level by adding a sense of modern pragmatism to the ultra feminine aesthetic the fashion house is known for. Reinterpreted coverup mainstays and accessories ranging from hooded capes, trench coats, to transparent knee and thigh-high boots and handbags, stood out in a major way against the label’s signature head-to-toe tweed looks. The grosgrain ribbon-trimmed PVC boater hat from the collection appeared to be a favorite among the street style set: many it girls including stylish industry insiders Tamu McPherson , Eva Chen, and blogger sisters Sylvia and Julia Haghjoo were all spotted wearing the high-gloss translucent topper. 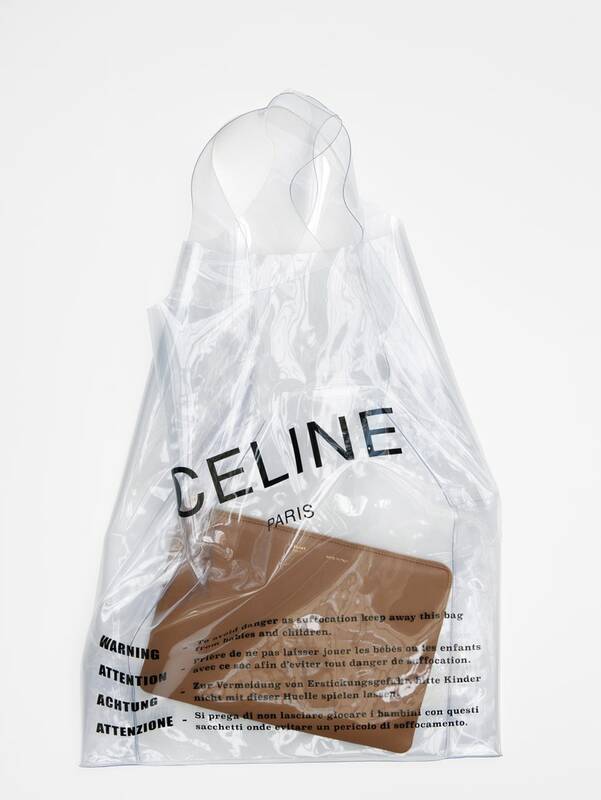 First spotted on Céline’s Spring-Summer 2018 presentation’s runway, this plastic shopping bag resurfaced on the latest Fashion week sidewalks carried by a bevy of street style darlings who were lucky enough to get their hands on this new it item. As part of an exclusive collaboration with American department store Nordstrom, this highly-covetable sack is currently only available at the Céline x Nordstrom pop-up shop in downtown Seattle. The ephemeral shop which opened on February 16th will go on until May 29th 2018. Should you be lucky enough to score one (and not intimidated by the hefty $590 price tag) it will surely make for a perfect carryall to put on display your small pastel-hued leather goods, printed scarves, and favorite Mac lipstick while keeping them dry. Now that Spring is officially around the corner, every stylish girl is secretly hoping for a little rain just to be able to step out in the season’s piece de resistance: the PVC trench coat. Who’s jaw didn’t fall to the floor when Raf Simons’ debut collection for Calvin Klein 205W39NYC featured a series of subversive plastic-covered fur and checkered wool trench coats? 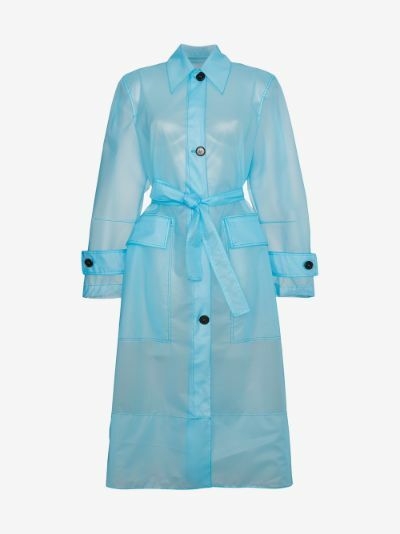 For Spring 2018, Simons’ cutting-edge yet functional use of the material has resulted in a range of Hitchcockian-inspired coats including this semi-sheer blue polyurethane belted design available at brownsfashion.com. Kind of makes you want to sing Aqua’s lyrics ‘Life in plastic, it’s fantastic’ doesn’t it?